Sister Regina Brown, S.S.J. (formerly Sister Joseph Richard), died Aug. 19 at St. Joseph Villa, Flourtown, at age 86. She was in the 68th year of her religious life. Daughter of Joseph Brown and Ellen Bewely, she was born in Philadelphia and attended Nativity B.V.M. Grade School and Little Flower High School in Philadelphia. She entered the Sisters of St. Joseph in September 1949 and professed her final vows in August 1957. 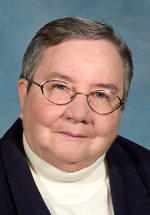 Sister Regina ministered in the Archdiocese of Philadelphia and the Diocese of Camden. She was the sister of Richard Brown (Sally Ann), Joseph Brown (Betty) and Gerry Brown. She is also survived by nieces, nephews and members of her congregation, the Sisters of St. Joseph of Chestnut Hill. The funeral Mass was celebrated Aug. 23 at St. Joseph Villa. Donations in Sister Regina’s memory may be made to St. Joseph Villa, 110 West Wissahickon Avenue, Flourtown PA 19031-1898.